We are BIG into sensory play around here. My kiddos love kinetic sand and play with it on the daily. It's become a permanent part of my kitchen counter because every time I attempt to put it away, they drag it out again within an hour. We prefer the Kinetic Build sand because it sticks together a little bit better and makes less of a mess (yay!). They also love play-doh, Mad Matter, Floam, DIY slime, and anything else that is squishy. 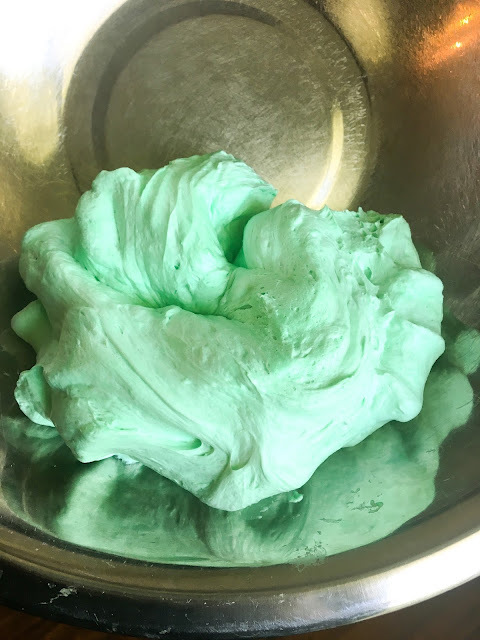 We make our slime recipe quite often and if you haven't attempted it yet, you should really check it out! 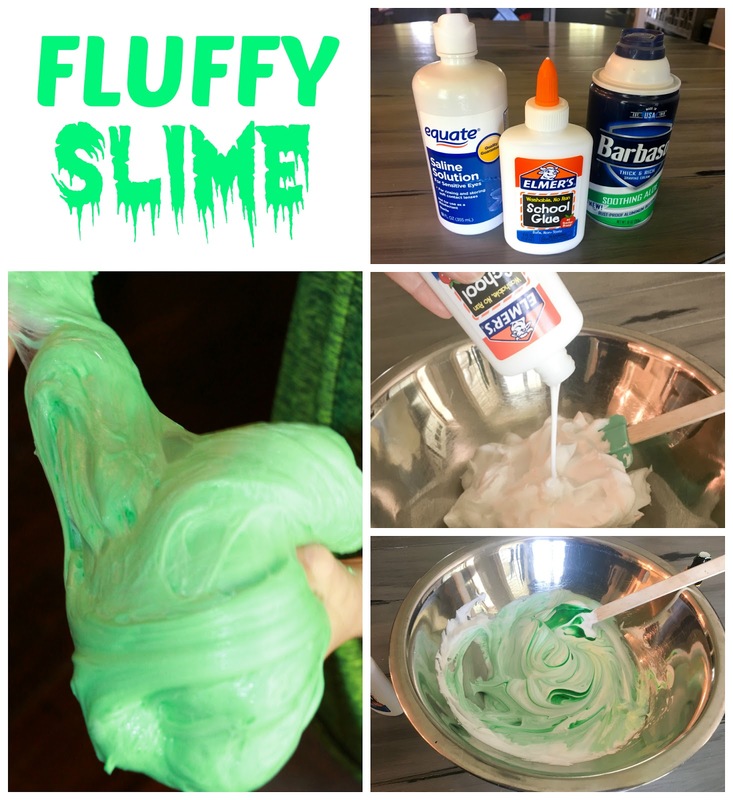 My mom recently came across a recipe for fluffy slime, so of course we had to give it a whirl. It was so fun and the boys LOVED it! 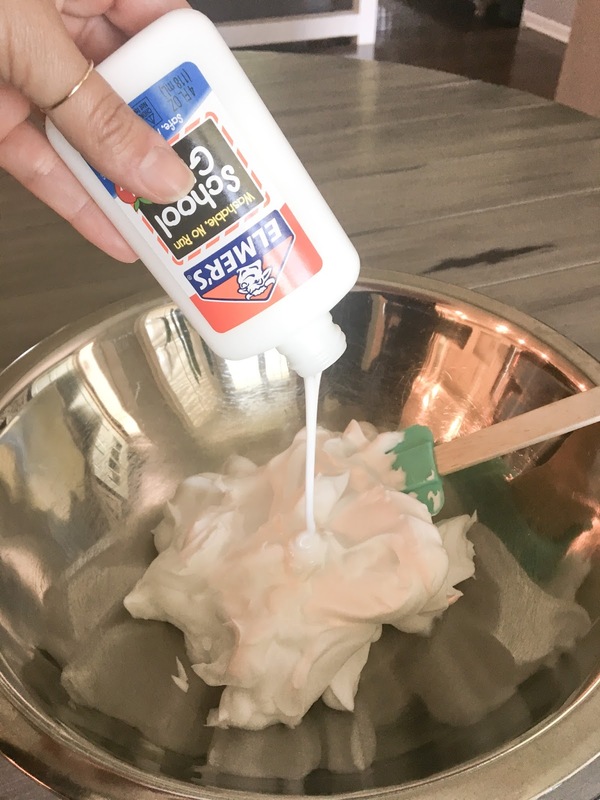 In a large bowl, measure the shaving cream, then add glue and mix to combine. If you are adding food coloring, add it before you add the contact solution. 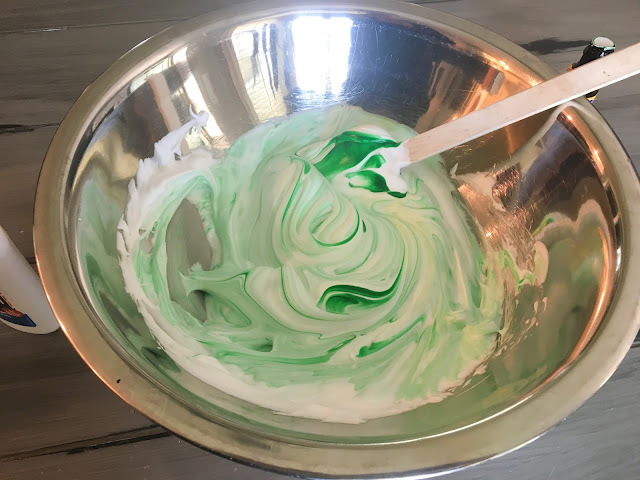 It will be easier to mix the color thoroughly prior to adding the slime activating ingredient! Slowly add contact solution, continuing to stir until you get the desired consistency. The original recipe called for 5 tablespoons of contact solution, but we ended up using a lot less then that. 2-2 1/2 tablespoons seemed perfect for us. 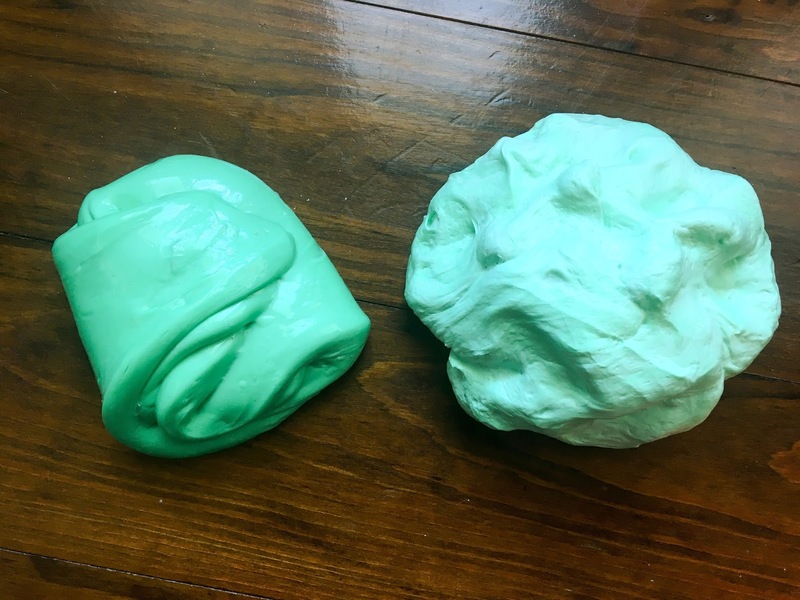 That's the thing about slime though...I don't think there is a perfect recipe that comes out exactly the same each time. So, you just have to mix and feel and decide when it seems like it's a good consistency. Measuring out shaving cream is not an exact science, so use the measurements as an approximate guide and wing it! 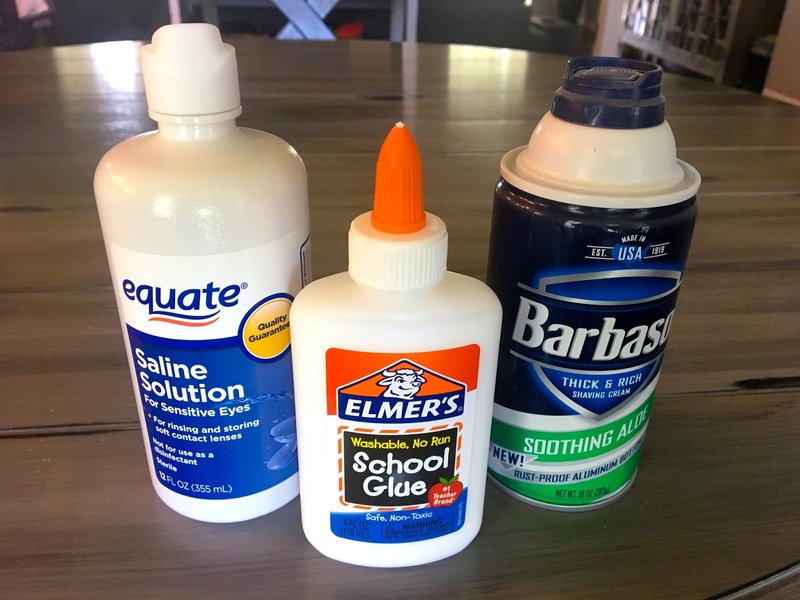 We questioned whether the shave gel would work as well as the shave cream, and honestly we couldn't tell a difference! They both seemed to have the same consistency once everything was mixed together. Another interesting find was that it turns into regular slime after a while. 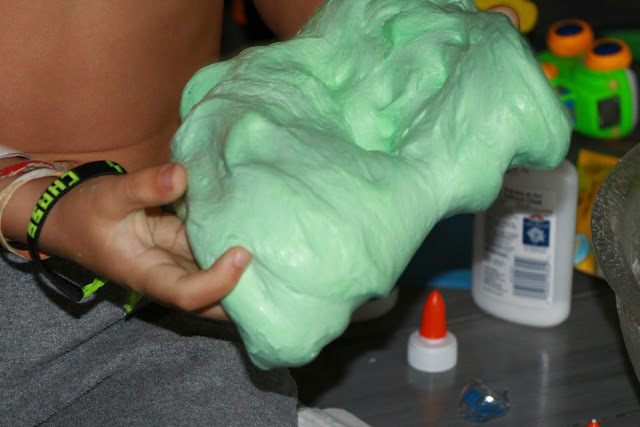 We put it in baggies to store it and a few days later it appeared to have lost it's fluff and was more the texture of standard slime. Here's a pic of the freshly made fluffy slime (right) and the week old slime (left) Can you see the difference? The good news is that it was still super fun to play with even after it lost it's fluff, so you basically get 2 slimes in 1! If your kids like squishing things through their little fingers, then you should definitely add this to your "to do" list for the weekend! It would be perfect for a rainy day to keep the boredom at bay! Side note, this slime was pretty easy to clean up. It washed off easily with soap and water, and the little bit that did get on their clothes, washed out. However, if you are adding food coloring, the coloring might stain, so it's probably best to have them wear play clothes! **Some of the links in this post are affiliate links, which means I may make a small commission. This does not affect the price you pay but it does help me maintain my blog!